In late July HEXUS reported upon the rumours, originating from Golem.de, regarding the thermal interface material used by upcoming top-end Intel Core 9th gen series processors for desktops. Now we have some new professional and official looking Intel-like presentation slides, via VideoCardz, that appear to back up those earlier rumours. It looks like the first salvo of new Intel Core 9th gen series processors (Coffee Lake Refresh) will be the high-end unlocked processors as follows; the Core i9-9900K, Core i7-9700K, and Core i5-9600K. This falls precisely in line with earlier rumours. There is confirmation provided for base and boost clock speeds, core counts, TDPs and more. The above slide confirms that at least the top end Intel Core i9-9900K will arrive with a new Solder Thermal Interface Material (STIM). However, as Intel writes that "not all features are available on all SKUs" we don't know if the Core i7-9700K or Core i5-9600K will come with STIM (reminds me of StarCraft). Earlier rumours, that appear to be now confirmed, contained the detail that octa-core parts would come with a STIM while lower-end fewer-core parts will make do with the less thermally efficient but cheaper paste. 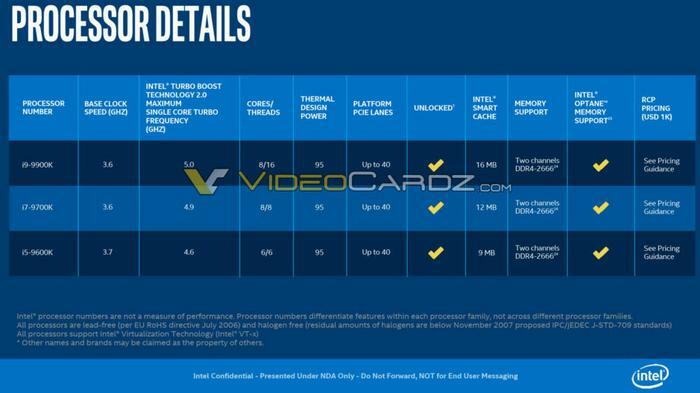 In a final slide shared by VideoCardz, you can see that Intel reckons its new S-Series parts are ideal for gaming, creating, and overclocking, on a robust computing platform. With up to 8C/16T and clockspeeds of up to 5.0GHz users should see strong in-game and streaming performance, plus content creation speedups. Specifically with regard to overclocking, Intel says that "STIM delivers a desired benefit to the overclocking community". 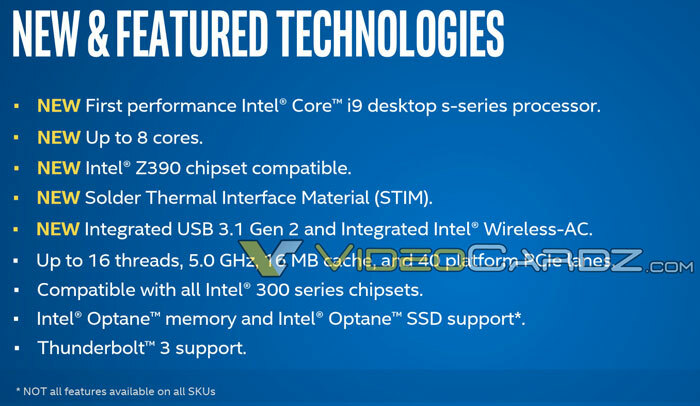 Whichever Intel Core 9th gen series processor you choose, Intel says that the Z390 chipset will deliver optimal performance and nice extras like USB 3.1 Gen 2, and Gigabit Wi-Fi. Lol. Have to love how they are trying to sell this as ‘new’. They must think we are idiots. Well, according to the sales figures..